What is a Safari exactly? An expedition involving wildlife observation and tracking. A pilgrimage. Travel as a life experience. Space is confirmed when a deposit of $1,000.00 per person is received. The Stanley Hotel is one of Nairobi's most famous landmarks and maintained its reputation as one of the best international-class hotels in the city center. The hotel boasts 220 deluxe rooms, club-rooms and tastefully appointed suites, all of which have been upgraded to supply every modern convenience. You only have to step outside the door for shops and restaurants and the internationally renowned rendezvous point and pavement café, the Thorn Tree Café is within the hotel grounds. Tortilis Camp lies on the edge of the Amboseli National Park, in the shadow of Africa's highest peak, Mount Kilimanjaro. Named for the umbrella shaped thorn trees under which it is built, Acacia Tortilis, this tented camp beckons you away from the stresses of life and surrounds you with luxury. Tortilis Camp creates an oasis - a place of peace, a place of solitude. The camp has 17 specially designed luxury tents offering a unique, extra large semi circular verandah. This affords breathtaking views of the snow capped Mt. 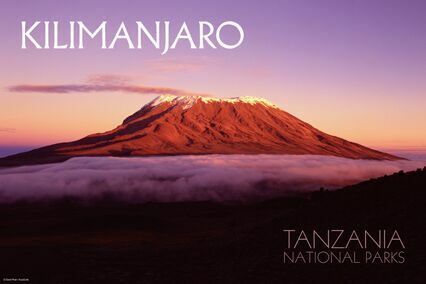 Kilimanjaro, the highest mountain in Africa, from the privacy of your own tent. Every care has been taken to preserve the natural surroundings and ecosystem. The camp is powered by solar electric panels. The bar and dining areas overlook a water hole which is frequented by elephants and other game. The camp sits on the edge of the park on land owned by the local Maasai. Tortilis Camp offers a wide variety of activities ranging from early morning and mid-afternoon game drives, guided game walks led by a Maasai guide outside the park, and hilltop sundowners. Alternatively, you can laze around the pool enjoying drinks and the stunning view. 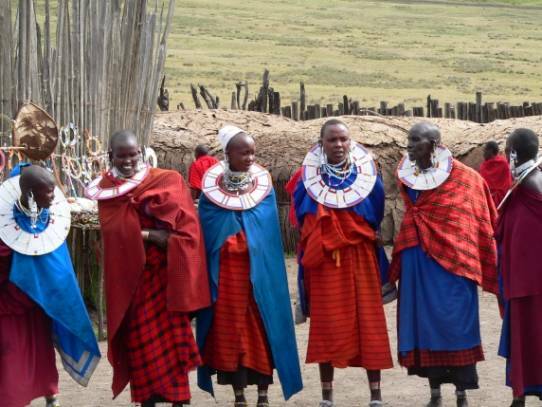 Working closely with the local Maasai people, it is managed as an ecotourism lodge, winning the British Airways "Tourism for Tomorrow Award" in 1995 for its excellence in responsible tourism. 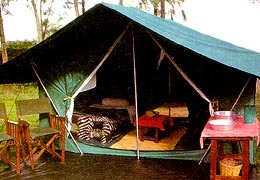 In 1996 Travel News Magazine awarded it the "Best Tented Camp" in East Africa. Visits to the nearby village (bomas) give guests an insider’s view of the way of life that has remained unchanged for centuries. Amboseli is famous for its big game - elephants, lions and cheetahs are the main attractions - and for its great scenery & beauty. Amboseli embodies five main wildlife habitats, plus a generally dry lake-bed - Lake Amboseli. These are open plains; extensive stands of yellow-barked acacia woodland; rocky, lava strewn thorn-bush country; swamps and marshes; and at the western end of the reserve, above Namanga, the massif of Ol Doinyo Orok rising to over 2,760m (8.300ft) and still for the most part zoologically unexplored. The landscape is dominated by the glistening majestic snow cap of Mt Kilimanjaro immediately to the south. Amboseli National Park is one of the best places to see elephants in Kenya. In the dry bush country towards Namanga you can find two interesting antelopes; the long -necked gerenuk (giraffe-necked antelope) and the fringe-eared oryx. Bird life is in abundance especially near the lakes and swamps where you may find water birds. The Madagascar Squacco Heron shows up in intervals and the long toed lapwing is a resident in small numbers. Birds of prey include the six species of vultures, the Taita falcon and the Southern branded Harrier eagle. It is a must to get some pictures of elephants grazing fresh grass from the swamps in front of the Mount Kilimanjaro. To do so, you will need to wake up early (not later than 7 am) as the Kilimanjaro is becoming a mass of clouds after 10 am (even if the sky is blue and unclouded). Then, go around the main Ol Tukai and Olokenya swamps as elephants are coming down from the mountain to feed in the swampy areas. Stop your car, drink your hot coffee and photograph to the sound of pulled out grass! All-inclusive Pricing: The prices include all major expenses, meals, accommodations based on double occupancy, and park fees. Virtually the only things that you will need to pay for while on safari are gifts and your own personal expenses. Cultural Interaction: Visit a small rural farming village on the slopes of Mt. Meru. This visit is exclusively for Thomson Safaris' guests. Near Ngorongoro Crater we meet the colorful Maasai people as well. Conservation and Park Fees: Wildlife viewing in Tanzania's most abundant wildlife areas - Tarangire National Park, Ngorongoro Crater and the Serengeti. Complete Pre-departure Information: After making your reservation, you will receive a package of detailed information to help you prepare for your trip. It includes terms and conditions, pre-departure instructions, a packing list, health requirements, visa regulations and all your flight details. On-site Welcome Orientation: This valuable briefing will help familiarize you with what's ahead, as well as give you practical information about the day-to-day details of your trip. Daily Briefing: A daily safari briefing will help prepare you for the next day of game viewing. Internal Flights: Serengeti to Arusha, Kilimanjaro to Nairobi. Passports and visa fees: USA passport holders require visas for Kenya & Tanzania. These are obtainable at the port of entry into Kenya & Tanzania, payable in cash. The cost for a single entry visa is $50 per person per country. It’s highly advisable to obtain the visas in advance from the respective embassy in Washington DC. It is the vast number of baobabs that first capture the eye as you enter Tarangire National Park. The gently rolling countryside is dotted with these majestic trees, which seem to dwarf the animals that feed beneath them. The park is spectacular in the dry season when many of the migratory wildlife species come back to the permanent waters of Tarangire River. June to October is the best time to see large number of wildebeest, elephants, zebras, and hartebeest. Not all animals are migratory though; other animals such as giraffes, Impala, Eland, lesser kudu, waterbuck, gazelle and sometimes rhinos or leopards can be seen throughout the year. 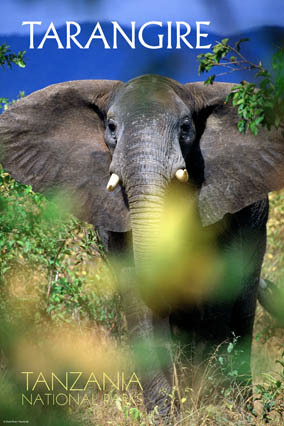 More people are attracted by the giant pythons and large herds of elephants. Tarangire's pythons climb trees, as do its lions and leopards, lounging in the branches where the fruit of the sausage tree disguises the twitch of a tail. The park is also famous for migrant birds. Tarangire National Park covers approximately 2600 square kilometers and, in the dry season, is second only to Ngorongoro Crater Conservation Area in concentrations of wildlife. Tarangire lies to the south of the large, open grass plains of southern Maasailand, and derives its name from the Tarangire River, which provides permanent water for wildlife in the area. As a holiday destination Tarangire is a lot less busy than other parks in the north of Tanzania. Going on a safari here offers you a chance to savor a real slice of Africa's wilderness and solitude. 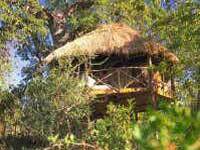 Tarangire Treetops is located within the 57000 acre Tarangire Conservation Area straddling the wet-season migration route into the adjacent Tarangire National Park. Located just outside Tarangire National Park, this safari camp is the epitome of rustic luxury. It is small and intimate with delicious meals and a wonderful view over Tarangire's unique landscape. Each en-suite unit has a private veranda and lounge area, with sweeping views over their private Conservation area. Tarangire Treetops features 20 luxury en-suite rooms, built atop tree-attached platforms, overlooking the Tarangire Sand River. The camp has been superbly blended into the environment with the sleeping platforms built into a variety of Baobab, Mopani and Wild Fig trees. The dining area is situated close to the swimming pool and elephant water hole is an innovative and stunningly original property consisting of large tree houses built upon platforms amongst a cluster of Baobab, Mopani and Wild Fig Trees. This is one of the premier properties in Northern Tanzania. Home to a unique ecosystem, the area has all the same species of wildlife as the Tarangire National Park, including buffalo, lion, cheetah, leopard and elephant. Huge herds of elephant frequent the site of the camp on their way to watering in the Sand River, ensuring year-round resident game. The establishment of this camp has also resulted in many developments for the village, including improved water facilities and a school, as a percentage of all visitors’ lodging costs is donated to several village improvement schemes. The camp also offers the unique facility of night drives and game walks, including a special trail for mountain biking. Armed rangers whose knowledge of the bush is legendary accompany all ventures. Continue your exploration of Tarangire today, searching the trees for leopard, watching as elephant play, bathe and socialize near the river and spotting lion, cheetah, hyena, and a multitude of birds as they go about their fascinating daily routines. Tarangire comes into its own during the dry season (July - November) when enormous populations of elephants and other animals are drawn to the Tarangire River and other sources of permanent water. Game viewing during the transition months of June and December can be fair to good depending on the rains. During the wetter months (January - May) much of the game will be dispersed and out of reach outside of the park. January and February are usually still decent for game viewing but March, April and May offer poor game viewing. After breakfast, depart for Ngorongoro Crater. As you reach the top of the crater wall, your first glimpse of the crater floor is nothing short of awe-inspiring. The world’s largest unbroken caldera, the crater is a geologic marvel, and in addition, boasts some of the densest wildlife populations in the world. This mini-ecosystem of savanna, forest and small lakes sustains a huge number of non-migratory animals from gazelle, zebra, wildebeest, hyena, hippo and elephant to flamingo, cheetah and African buffalo. In the evening, return to your lodge or camp, perched high on the crater rim. Unique is a thoroughly overused word, but it really does apply to the Ngorongoro crater. This is the largest unbroken caldera in the world - and it's full of big wild animals. Ngorongoro Crater is only the best known of a large number of volcanic mountains in the area; the underlying geology is the result of volcanic activity along the edge of the Rift Valley some two million years ago. The Crater, which makes up only 3 percent of the Ngorongoro Conservation Area, is a microcosm of East African habitats and game holding an extraordinary variety and concentration of wildlife. This is one of the few areas where you have a very good chance of seeing some of East Africa's last wild black rhino, and inside a day you have a very good chance of seeing all of the big five. Ngorongoro Conservation Area (NCA) of about 828 Sq. Km. is the most perfect caldera of the world. At 18km across, often with nothing we can compare it to, this is one of the wonders of the world! You will be attracted by the relief, its mountains, drifting sand dunes, the diverse wildlife and the Maasai people. Due to these qualities including its being nearer the cradle of mankind, the Olduvai Gorge, The NCA was declared a World Heritage Site in 1978. This is the only place on the planet where human beings still live in harmony with wildlife without harming one another. To date the only place to witness this is the Ngorogoro Conservation Area. Classic Camping affords the luxury of sharing the wilderness with the wildlife. It is intentionally simple, yet the service goes far beyond what you might expect from even the most comfortable lodge. The charm is in the rusticity, and you will find yourself feeling inexplicably pampered in these quiet and secluded camps. The Classic Camps are modeled on the traditional mobile tented safari camps enjoyed by Hemmingway and Karen Blixen. You'll be closer to nature, but not too close for comfort. We don't believe silver tea sets, Persian carpets, crystal glassware and starched uniforms are particularly appropriate in the wild, but you will be safe and comfortable, and you will receive excellent service and attention from our friendly camp staff. Each large, walk-in tent has a straw mat floor, two camp beds complete with mattresses, pillows, sheets, blankets, and a bedside table. The tents have fine mesh windows and doors for ventilation and are completely mosquito and bug proof. Classic Camps provide the utmost in comfort with one enormous benefit: the stars serve as your roof and the gentle breezes as your air-conditioning. Set in parks and private game reserves Classic Camps provide ample space in large, walk-in tents complete with twin beds, linens, a small bedside table, and lighting. Attached is your own private toilet and nearby you'll find a shower tent offering hot showers any time of day. Camp will be set up prior to arrival. You stay in large walk-in tents equipped with two camp beds, pillows and mattresses, sheets and blankets. A sanitary portable toilet is in its own small tent attached at the back of each sleeping tent, along with a shower tent providing hot safari-style showers at any time of day. Hot showers are available every day. Camp lighting is provided by kerosene lamps. A separate tent is set apart for dining -- hearty, healthy meals are prepared by our camp cooks, using fresh meats and produce from our own private suppliers. It's all so comfortable, the term "roughing it" simply doesn't apply. The dining tent is complete with tables, chairs and tablecloths. Our cooks are the best around, presenting delicious, varied, ample meals. In the evening, after a delicious & healthy meal expertly prepared in an outdoor "kitchen" by our camp chefs and served in the spacious dining tent, retire to the campfire to share stories and marvel at the billions of stars overhead in the endless African sky. Fall asleep to the sounds of the African night – lions calling to each other in the distance or the eerie howl of hyenas, and maybe even the muffled munching of a buffalo or wildebeest not far away. This is the most eco-friendly way to travel in Africa, and our travelers say it is one of the most memorable safari experiences. Heading west, depart the Ngorongoro Conservation Area and, on your way to the Serengeti, stop at Olduvai Gorge, an archeological site of extraordinary importance in our understanding of the origins of “man.” Here in these desolate gullies, several generations of the Leakey family toiled for decades in search of prehistoric clues in the mystery of human evolution. The small museum details some of their most important finds, among them the skull of “Zinjanthropus Man” and the 3.6 million year old australopithecine footprints from Laetoli. From here, continue into the vast Serengeti plains, game viewing and stopping for a picnic lunch as you approach your secluded camp. The wildlife viewing within this eco-system is unparalleled. Some of the largest herds of hoofed animals congregate here: gazelle, wildebeest, zebra, giraffe and buffalo, for example. From the rustic luxury of your camp, you will have a chance to relax around a roaring campfire, explore the area on a guided walk and fall asleep to the sound of nearby animals. All the while, your attentive camp staff takes care of your every need. The Serengeti National Park is Tanzania's largest and probably one of the best known in the world. It begins about 100 miles to the west of Arusha. 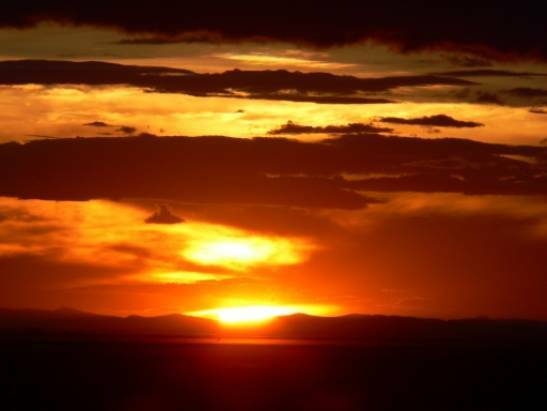 To the east it's bordered by the Ngorongoro Highlands and the Great Rift Valley and to the West by Lake Victoria. The main park which covers around 15,000 sq km is drained to the west by three main rivers, the Mara, Grumetui and Mbalageti Rivers. This area forms only a part of the whole Serengeti ecosystem, which extends to the surrounding game reserves; Maswa to the southwest, Grumeti and Ikorongo controlled areas to the west, Loliondo to the east and the Maasai-mara in Kenya to the north. The Serengeti is probably best known for the awe inspiring wildebeest migration in which millions of animals circulate through the ecosystem annually, moving onto the 5000 sq km of grassland in the wet and retreating to the woodland areas in the dry. It's undoubtedly one of the most dramatic wildlife spectacles any where in the world and with a little luck we can get you right into the middle of it. Sitting in a vehicle surrounded by 10's of thousands of wildebeest and all the accompanying noise is an experience you won't quickly forget. As the migration is dynamic and depends on weather patterns the best way to find the migration is using mobile camps. This morning you may opt for a balloon safari (advance reservations required) to gain a dramatic bird’s eye perspective of the Seronera River, the wildlife at its banks, and the maze of animal tracks that wind their way through the plains. Return to camp for lunch with the option to relax in the afternoon or stretch your legs, exploring the surrounding landscape. Your camp is the perfect location for a guided afternoon walk during which you can identify footprints or examine the unique plant life that thrives on the savanna and provides sustenance to a wide array of birds and mammals. You have another full day to journey far and wide in this immense park, allowing your guide’s unerring instincts to lead the way. An infinite number of dramas play themselves out on these endless plains: predators stalk prey, animals eat, scavenge and graze, mothers nurture their young, birds hover and soar overhead, young animals frolic as older animals keep a watchful eye on these vulnerable little ones… in short, it is a story of life and death, decay and renewal and ultimately, survival of the fittest. Tonight, enjoy one more night in this unforgettable wilderness and prepare for your re-entry into the bustle of the modern world. This morning, take your flight back to Arusha, arriving in time for a farewell lunch. Day rooms are provided for the people who are leaving us tonight. This exclusive manor was built in 1932 by Sir David Duncan, is situated on 120 acres of land just a few miles from the center of Nairobi. In 1974 Jock Leslie-Melville and his wife Betty, who also founded the African Fund for Endangered Wildlife (AFEW), bought the Manor. They then moved five babies of the highly endangered Rothschild giraffe to their property where they have been successfully reared and they now have their own babies. Giraffe Manor is now open to visitors. Exclusive, spacious and elegant, it is the only place in the world that you can feed giraffe from your second floor bedroom window, over the lunch table, and at the front door. Guests can feed and photograph the giraffe and the Warthogs at the Manor, and also wander through the adjoining primeval forest to view the bushbuck, dik dik, and more than 180 species of birds. There are four double rooms with bath, as well as one double room with shower. One bedroom is furnished with all of Karen Blixen's ("Out of Africa") furniture that she gave to Jock's mother when she left Kenya. Included in your stay is admission to the world-famous Giraffe Center next door, run by the African Foundation for Endangered Wildlife. The manor is a short giraffe-step from several of Nairobi’s other natural attractions, including Karen Blixen’s farmhouse and Daphne Sheldrick’s famous elephant orphanage. Stay overnight at the KIA Lodge. KIA Lodge is located only about 2-3 minutes from Kilimanjaro International Airport. The lodge consists of 40 rooms in individual chalets. Each chalet is spaced throughout the wonderful acacia tree property on stone pathways. The rooms are spacious and quite comfortable and each room is pleasantly decorated with Makonde woodcarvings. There is a small writing desk and comfortable wicker chairs. The chalets or bungalows are equipped with air conditioning though you will unlikely have a need for it. You may choose from double rooms with two twin beds or a larger room with a third bed for families. The main lodge structure and area is very nice and consists of an open sided restaurant, an open air terrace bar above the restaurant and a superb swimming pool area on top of a hill. The open air bar offers a spacious and relaxing environment to enjoy a dink after dinner or meet other guests. However, the real highlight of KIA lodge is the swimming pool terrace which is set on top of a hill above the bar. From this area there are amazing 360 degrees panoramic views of the surrounding area including Mount Kilimanjaro and Mount Meru. The views combined with the well appointed pool makes for a great spot to relax on perhaps your last day in Tanzania before catching your flight back to civilization. KIA Lodge offers most likely your only chance to gaze at the highest free standing mountain in the world, Mount Kilimanjaro. This will certainly be the case if you will not be Kili - trekking or visiting Arusha National Park. The mountain is not visible from any of the lodges in Arusha or from the famous national parks of northern Tanzania such as the Serengeti, Ngorongoro, Lake Manyara or Tarangire. The views of Kilimanjaro from KIA Lodge are spectacular and especially at sunrise and sunset when you frequently can see her snowy top unobstructed by clouds. The name itself is a mystery wreathed in clouds. It might mean Mountain of Light, Mountain of Greatness or Mountain of Caravans. The local people, the Wachagga, don't even have a name for the whole massif, only Kipoo (now known as Kibo) for the familiar snowy peak that stands imperious, overseer of the continent; the summit of Africa. I’ve chosen the best operator to lead your trek. Thomson is the best choice for a trek to the "Roof of Africa". 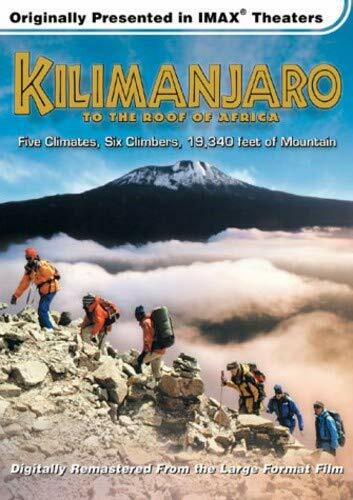 They are dedicated to providing the highest quality and safest Kilimanjaro treks available. With over 24 years of experience, they have the tools and the know-how to back up their words. We specialize solely in running Kilimanjaro treks and safaris to Tanzania's magnificent wildlife parks. Our focus affords an expertise that other companies can't match. 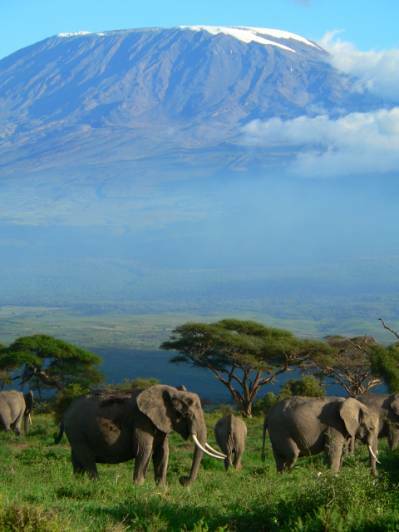 We've guided safaris in the Tanzanian bush and guided trekkers up the slopes of Kilimanjaro for over 22 years. We've worked out the kinks. Our Tanzanian guides are rigorously trained by us, and impart their knowledge with passion and reverence. The 9-day Western Breach Route is the route chosen by David Breashears for the IMAX film: “Kilimanjaro - To the Roof of Africa”. It’s a world-class trekking experience, with a high camp amidst towering glaciers at 18,750 ft., inside Kili’s dormant volcanic crater! The summit is reached by the mountain’s least traveled route and because of the short distance from the last camp to the Summit of only 600 ft. you can trek to the summit in daylight! After a hearty breakfast and a climb briefing, you’ll be transferred to the Londorossi Gate (5,900 ft.) to begin your climb. This first trekking day is through dense rainforest (approx. 80 inches precip / yr), under the tangled canopy of moss-coated vines, which are home to the black & white colobus monkey, blue monkey, and a vibrant array of exotic birds. Arrive at your camp set in the lower heather belt and enjoy a hot dinner in the mess tent.